The addition of sun-dried tomatoes to opal basil produces a pungent, intense pesto that is splendid as a sauce for pasta, fish and fres green beans. Sun-dried tomatoes imported from Italy are preserved with herbs and are particularly potent in this extraordinary blend. See how to make your own Sun-dried Tomatoes and refer to the recipe for making you own sun-dried tomatoes in the book Pestos! : Cooking With Herb Pastes by Dorothy Rankin Pages 126-128. 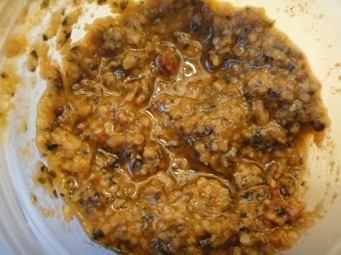 Mix the basil, tomatoes, garlic, cheese and pine nuts in a food processor or blender. With the machine running, slowly add the olive oil. Season to tasted with salt and pepper and blend to the desired consistency.